Bredbo: Why live in Bredbo? Bredbo real estate is predominately acreage. Largely a rural area, sizeable properties do come on the market along with mid size hobby farms and smaller lifestyle blocks. Housing in the township of Bredbo is of colonial style with some newer buildings being constructed although this appears to be mainly on the lifestyle blocks. 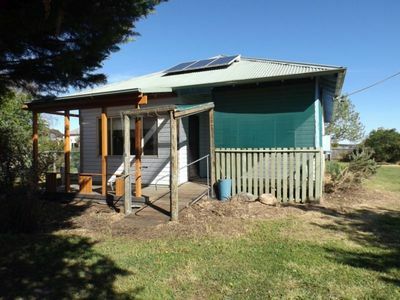 Bredbo is located close enough to Cooma for it to be a viable housing option for those seeking a rural lifestyle. With Canberra and Queanbeyan a mere 76 kilometres away Bredbo is also a practical option for city residents to acquire a weekender or hobby farm. Bredbo has two churches, a general store and a post office. In recent years the Bredbo Christmas Barn opened their doors and it has fast become an annual pilgrimage for some and a welcome driver break for others. The store is a virtual Aladdin’s cave glittering with lights, fairies, elves and Santa’s. An absolute delight to visit the Bredbo Christmas barn is recommended as a special outing for little and grown up lovers of Santa and all things Christmas. Bredbo school aged children attend the Bredbo Public Primary School. Secondary aged students attend public or private secondary schools in Cooma. The Bredbo and Murrumbidgee Rivers are the perfect place for a picnic and a day of fishing. Bredbo is on the road to the beautiful Snowy Mountains and a day of skiing is easily achievable from this picturesque township. Bredbo is located 33 kilometres from Cooma and 79.6 kilometres to Canberra. The Bredbo Hotel is a popular stopping place for traffic between the mountains and Canberra for a hot meal and a quick drink. The Bredbo Pizzeria is another well known eatery in the region. Interestingly, Bredbo is becoming well known for its boutique cold climate vineyards. The Pancake Parlour is another eatery worth visiting in Bredbo. It is located on the main road in what used to be the old general store. The Bredbo Inn is a main coach stop on the way to the South Coast and Snowy Mountains. The Bredbo Inn dates from 1839 when it was established as a stagecoach stop and Inn for travellers and train travellers. The Inn, in the early 20th century hosted aside from squatters, visitors and travelers, a number of Australian characters including the Australian poet, Banjo Patterson, Mark Foy, Anthony Horden and a few shady character bushrangers. Bredbo is a village on the Monaro plains of New South Wales, Australia. It was discovered in 1823 by Brigade Major John Captain Curries who described the area as being ‘strangely treeless with a great expanse of rolling rich grass lands.’ Bredbo township developed to support the squatter’s runs as squatters settled in the area. Believed to be one of the earliest settlers in the Bredbo district, John Cosgrove of Billylingera, held large landholdings and immense herds of cattle. In one year 68,000 sheep were shorn in the Billilingera shearing shed. The area’s growth was further assisted when gold was discovered nearby by William Branwhite Clarke. The gold field was proclaimed along the Bredbo River, which was worked until 1921. In the 1930’s a geological survey was undertaken and a mine opened and operated until 1942. The field at Cowra Creek was worked from 1888 and remains popular today with those interested in fossicking. In 1875 the first post office opened, in 1882 a school established and in 1888 Bredbo was proclaimed a village. In 1889, with the grand sum of eight houses in the district, a railway was built linking Bredbo to Sydney and Cooma. The railway closed in 1989 with a “Farewell to Bredbo” final train run from Canberra on 3 March 1990. So if you are looking for Bredbo Real Estate, why not talk to one of our sales team at Fisk and Nagle.